They concluded that it’s Eri’s thing to get holes in her socks. Eri conveniently came up with a catchphrase for herself: “Anaaki na Kamei Eri” (“Kamei Eri who tears her socks“). Fan mail #1: A listener asked Gaki-Kame how he should approach his crush. Gaki-san suggested that he should just go “yahoi!” (his radio name) to the girl. Gaki: The set-up is that the girl is sick? Eri later suggested to ask the girl if she’s feeling all right and when the girl asks why, the guy would say that he noticed that she didn’t look well. Kind of to show that he’s an attentive guy. Off-topic: talking about going to convenience stores alone, Eri shared a story on the Eri, Gaki-san and Linlin bus tour about getting her little sister Rina to go to the convenience store with her. One day after Eri came home from work she wanted to go to the convenience store but she didn’t dare to go alone, so she asked Rina to accompany her. But Rina wasn’t dressed up and she was just lazing around so it was hard for Eri to convince her to get up. She then bribed her sister to go to the store with her, promising to buy her anything she wants. So the two sisters went to the store… Eri picked up a basket… and so did Rina. 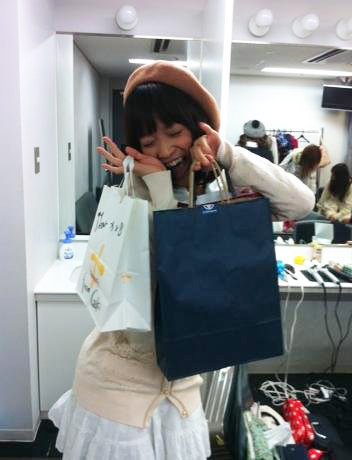 Rina took full advantage and bought up to 5000 yen of stuff. (Just imagine walking into a 7-11 store and picking up $50-$60 worth of items.) When they got home, Eri Mama was angry with the two girls (I can’t remember why) and Eri’s way of resolving the argument with her already angry mother was for her to lose her temper, too (reversed anger). Back to the good-for-nothing talk: Gaki-san said it’s pretty acceptable for a girl to be afraid of little things, but for a guy, he might receive more heat than a girl would. Gaki-Kame advised the listener to not change himself. All he needs is to find someone who will accept him for who he is. Talking about bugs, Gaki-Kame thinks that Aichan would probably be pretty manly and get any bug that’s being annoying. Random trivia: Eri was sitting cross-legged as she recorded this radio show. This week’s FIVE PLEASURES is a self-quiz. The penalty is to end the show with the voice of a witch, impersonate a crow, or to do as shown in the picture below and speak at the same time. Starting off with Gaki-san’s self-quiz. (She won at rock-scissors-paper against Eri. During one of the recent episodes, Gaki-Kame played rock-scissors-paper for like 50 times and Gaki-san only won twice, lol.) Her question is… Gaki-san has a favourite dish that she’ll always order when she’s dining at a particular restaurant. However, recently, when she went there she was told the dish is taken off the menu. What is the dish? Eri’s quiz. During the bus tour (with Junjun and Linlin), they had yakiniku for dinner. (Again — Eri’s self-quizzes always have something to do with yakiniku.) In the process they managed to burn their grill netting pretty badly. They still had some things that they had yet to grill though, and right then one of their make-up artists walked up to them, took one of their uncooked meatballs, and threw it onto the burned netting. The question is: what did they say? Gaki-san made pretty good guesses. She guessed songs like “Donguri Korokoro” (they all had to do with round stuff). They all had a good laugh when the make-up artist did that. Gaki-san was really envious and said she really wanted to be there. In conclusion, neither one of them got the answer right so… DOUBLE PENALTY! Fan mail #4: They read a letter from a fan from France. She thanked them for going to the Japan Expo in France and said she’s planning on attending Eri’s graduation. The promotion for the Yokohama concert reminded them that it’ll be Eri’s last Morning Musume concert soon and Eri’s excitement clearly went down immediately after Gaki-san said it’s the last. Eri: Kamei Eri Nosuke deshita!